Eagle Filters is a Finnish engineering firm that designs and manufactures air intake filters for gas utilities. Active in global gas turbine markets, Eagle Filters has recently been selected as the preferred air intake filter at the Astoria Energy combined cycle plant in West Queens, New York. After an intensive 3-year study of Eagle Filters and other competing suppliers of air intake filters, Astoria Energy is now installing Eagle Filters on all 4 of their turbine units. The combined output of the Astoria Energy plant, equipped with 4 gas turbines and two steam turbines, is roughly 1200 MW. The electricity generated at Astoria Energy serves 15% to 20% of New York City. 1 MW of electricity from the Astoria Energy plant serves approximately 800 New York City households. Better intake air filtration in gas turbines reduces the need to stop turbines for periodic washing. The washing of fouled blades on compressors also costs energy utilities money in lost revenues due to down time as well as labor costs for cleaning. During the test phase at Astoria Energy, the Eagle Filters’ TurboMaster EPA filters were able to provide a Heat Rate Improvement of approximately 1,5% while also providing an average output recovery / improvement of approximately 4 MW for one gas turbine. The estimated reduction in CO2 emissions through using Eagle Filters in this test period was 2750 tons CO2e per year of use. 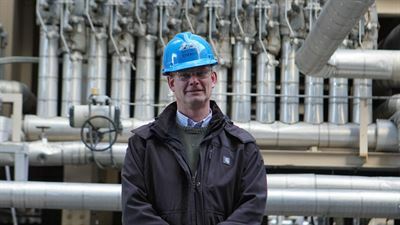 By using Eagle Filters’ technology in all of their four gas turbine units, it is estimated that the CO2e reduction per year for Astoria Energy will be 11 000 tons, which is equivalent to the yearly home energy use of 1,188 US homes, or the CO2 equivalent of 25,467 barrels of oil consumed. “Astoria Energy burns natural gas as its primary fuel and it is critical for keeping the lights on in New York City. I believe natural gas will play a significant role in the US energy market for many more years to come." “Natural gas is a clean alternative to other fossil fuels and the Eagle Filters will contribute to the overall efficiency of the Astoria project”. Astoria Energy has now installed 4224 filters supplied by Eagle Filters, and these filters are expected to provide clean air, free of urban and industrial pollutants and moisture to Astoria Energy for at least 3 years without the need for periodic washing of fouled compressor blades. Eagle Filters is a core holding of Loudspring, a company group that saves natural resources headquartered in Helsinki, with offices in Stockholm, Berlin and Los Angeles. Loudspring recently increased its ownership in Eagle Filters as part of their strategy update, now owning almost 64% of the company (with the option to increase to 80%).